Two weeks ago, I was fortunate enough to be able to facilitate a workshop at Mozilla Festival 2018, at Ravensbourne University London. I had submitted a proposal back in August, on the very last day of submissions, after hearing about MozFest from a friend. MozFest has a completely open submission process: anyone can submit a proposal, and all the proposals are made public on GitHub where others can comment on them. I was pleasantly surprised when a few weeks later I heard that my proposal had been picked! The session was part of the “Web Literacy” space, which seemed particularly appropriate for the topic of my workshop. At a time when much of our digital economy is built on capturing people’s attention, we each need to develop the ability to safeguard our attention and avoid distractions whilst online. When tech platforms are spending billions optimising their user experience and algorithms to keep users engaged and viewing adverts, it’s clear that if we as users are unprepared, we will get distracted by these platforms, spending our time on them instead of on things we’d rather be doing. In the worst cases users will be pushed beyond distraction into addiction. The topic of online distraction and addiction is a major theme for this blog, so much so that my first blog post was about how today’s tech is designed to distract. Online distraction as a battle? As MozFest approached I began to regret my choice of title: “Combating Online Distraction and Addition”. I chose this title very quickly as I was submitting my last minute proposal. Yes, I wanted to do a workshop on online distraction and addition, but why had I chosen “combating”? I have found myself using similar words, such as “fighting back” in my blog posts. This may seem like a small detail, a simple metaphor, but it continues to make me slightly uncomfortable every time I find myself using such phrases. I recently discovered the reason for this in a book. Fighting unconsciousness will draw you into unconsciousness yourself. Unconsciousness, dysfunctional egoic behavior, can never be defeated by attacking it. Whatever you fight, you strengthen, and what you resist, persists. When platforms are built to distract and addict their own users, the companies that own those platforms are displaying unconscious, dysfunctional egoic behaviour. But Tolle’s advice here makes sense: fighting Facebook, Google, or advertisers won’t be effective, and neither will it be effective to use that kind of language or thinking. Instead we need to build awareness, in ourselves and in those around us. We can develop a healthier relationship with technology, which is more task-focused and involves less distraction and addiction, but we don’t need to fight to get there. There was another sense in which “combating” was an appropriate title: not as an expression of what we should be doing, but the situation now. Sometimes keeping emails, notifications, and advertisement distractions under control feels very much like a battle! Participants will better understand the real costs (to their time and attention) of using many websites and apps which are free to access. They will understand that they can make choices which allow them to be less distracted and more “mindful” or focused in their use of technology, so that their behaviour which using smartphones and other devices better matches their intentions. They will be aware of tools and techniques to help with this and be prepared to try them out. I hope we will generate some new ideas to explore through further collaboration following the session. 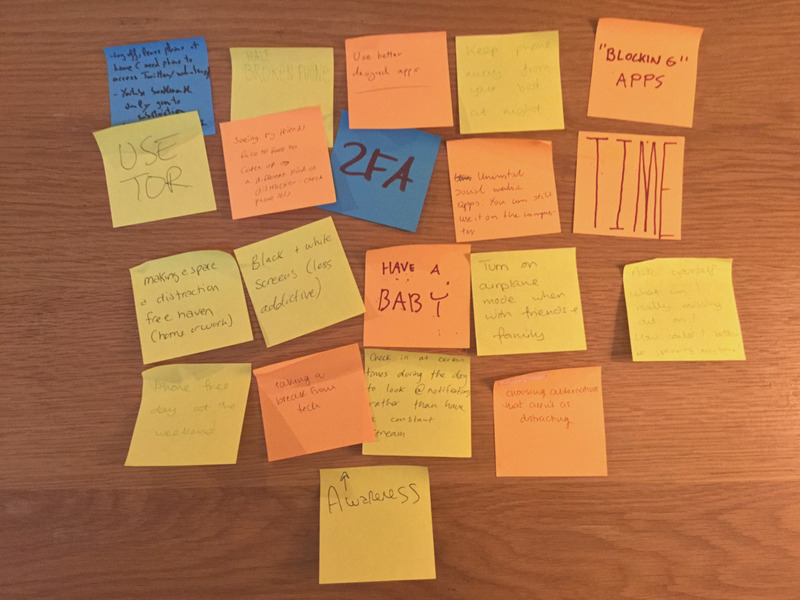 I believe that for many people today, the problem of online distraction is an everyday reality, so the best way to achieve the aims of the session was to talk about our experiences, with a few prompts to structure the discussion. We started with introductions and I asked people to share a little about their own experiences of distraction whilst using technology. The participants also wrote down on a sticky note any problems could think of relating to the topic of online distraction and addiction. I then read them out to the group and invited people to explain any they had added. How to balance being available for co-workers on email, IM, etc and getting uninterrupted work done. That’s an excellent crowd-sourced summary of the problems of digital distraction! Next I guided the group through a mini-meditation for one minute. I believe developing greater self-awareness is one of the best ways to be less distracted, and meditation is a technique which can help us develop that. It was meditation and mindfulness practice that first made me aware how distracting modern tech can be. In particular, it was the contrast between a tech-free meditation retreat I attended, and my daily life full of interaction with various devices. I’m not quite sure how the meditation went down with the group, but some seemed curious and asked me about it later. We moved on to discuss solutions to online distraction. At first we did this in pairs, focusing on our personal experiences and things we had tried in order to be less distracted whilst online. 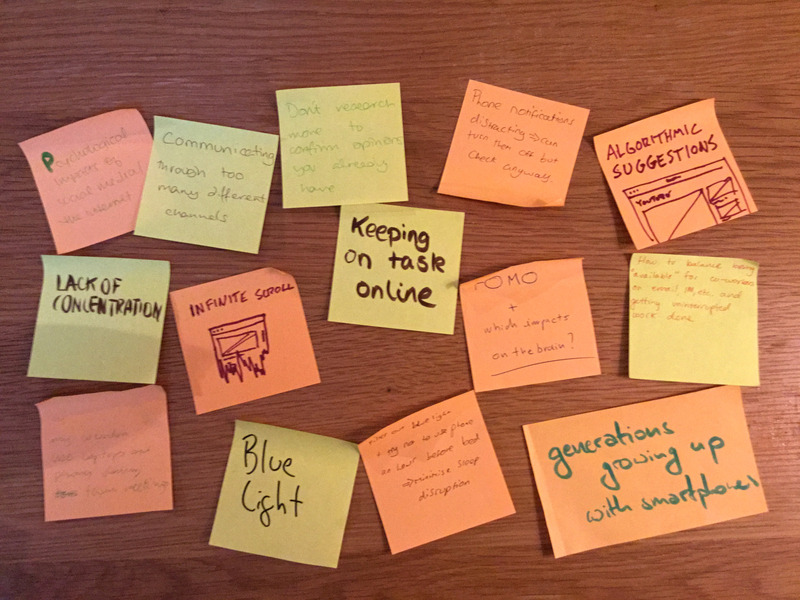 We then came back together as a group, and I asked people to write solutions to online distraction on sticky notes. We had some innovative solutions! These were all excellent suggestions. I’ve tried some of these myself: in particular I recommend removing social media apps from your phone and not keeping your phone by your bed (or putting it into airplane mode) – these are simple and easy steps anyone can take. After this we split into two smaller groups to talk about sub-topics. I had rough ideas for topics we could discuss, including technological / design solutions, business models, and personal habits or behaviour. What surprised me (given the fairly tech-savvy audience at MozFest) is that people were most eager to discuss behaviour. Perhaps I should not have been surprised: after all, our behaviour is the thing we have the most power to change to overcome being digitally distracted. Thinking up new tech innovations or business models may be part of the puzzle in the long term, but for most of us these are not directly applicable to our life now. For me that was an important takeaway from the session: whatever we may do to tackle this problem, we need to start with ourselves. My session was just one of around 300 sessions over the weekend. I was also able to attend a few of the others. Tim Berners-Lee gave a talk about the Solid project, but it was so popular that I couldn’t get in and watched the recording online later. I took part in a Redecentralize.org Decentralised App Speed Dating session, where I learnt about a number of interesting decentralization projects (and was able to give feedback to the creators). One session had a very similar focus to my own. “Technology, Consciousness, and Agency: Deconstructing Digital Design” took participants through a concept for an app, Analog U, which invites people to become more conscious of their bodies and emotions as they using smart phone devices. For example, what do we feel when we see we have new likes on Instagram, or our phone battery is low? Often these abstract concepts can lead physical manifestations in the body. By developing body awareness as we are using smart phones, perhaps we can become better able to adjust our behaviour when our phone usage is not healthy for us. Overall MozFest was a fun and interesting weekend, and I hope to go again in future years!